ANEB: Help and support for people with eating disorders and for their loved ones. Many professionals and researchers from different places turn to ANEB to recruit participants to contribute to studies on eating disorders. These studies allow for a better understand of eating disorders, their causes, consequences, and, most importantly, treatment options. Thanks to scientific research, specialized forms of therapy can be offered to clients. In this section, you’ll find the current research projects as well as instructions on how to participate. Are you a woman who experiences binge eating? The BEEP Lab at McGill University is looking for volunteers. If you are a woman between the ages of 18 and 60 years and you have times when you eat a very large amount of food and feel out of control when eating, you may be eligible to participate in a research study on biology, behaviour, and binge eating in women. This study involves two lab visits that will last 4-5 and 5 hours, respectively, and the completion of a one-hour questionnaire battery from home. During the lab visits, you will be asked to complete clinical interviews and several physiology tasks. If eligible, you will be paid $200 in return for your participation in all aspects of the study. To find out if you are likely to be eligible, please complete our brief screening questionnaire. The obsessive-compulsive and tic disorder studies centre at the Institut universitaire en santé mentale de Montréal is currently recruiting people to participate in an experimental study on a thought process associated with obsessive-compulsive disorder (OCD) and eating disorders. 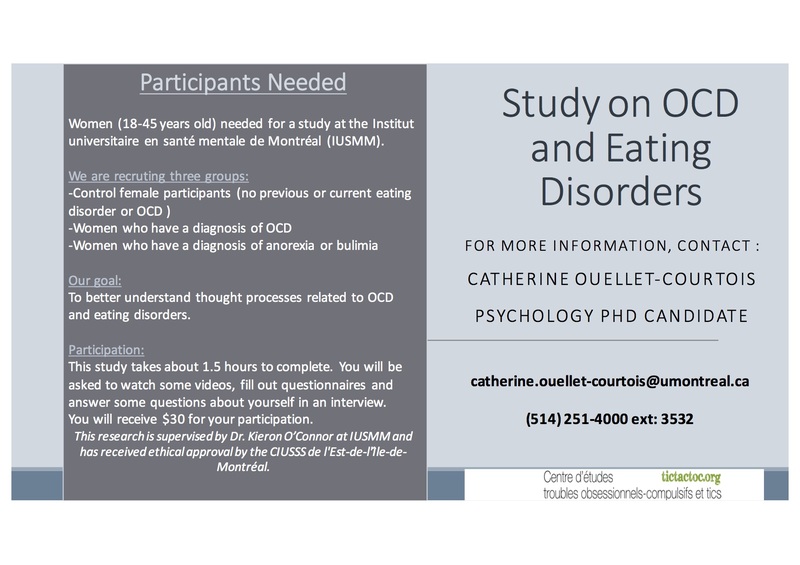 If you are a woman 18 to 45 years of age suffering from anorexia or bulimia, and you have not been diagnosed with OCD, you can take part in this study. It will only take an hour and a half of your time. The anxiety and perfectionism research laboratory as well as LoriCorps research center, at Université du Québec à Trois-Rivières, are looking for people who wish to participate in their research. The study examines the motives leading people to pursue certain behaviours related to perfectionism in terms of nutrition. To learn more about the goals of this research, or if you wish to participate, please download this document.